It took a little while for me to get into using Markdown text editors, but once I did I really started to like them. For me it combines the simplicity of Notepad with the formatting options offered by rich text editors. Markdown syntax definitely won’t be for everyone, but for some situations that’s my go-to method for jotting things down. 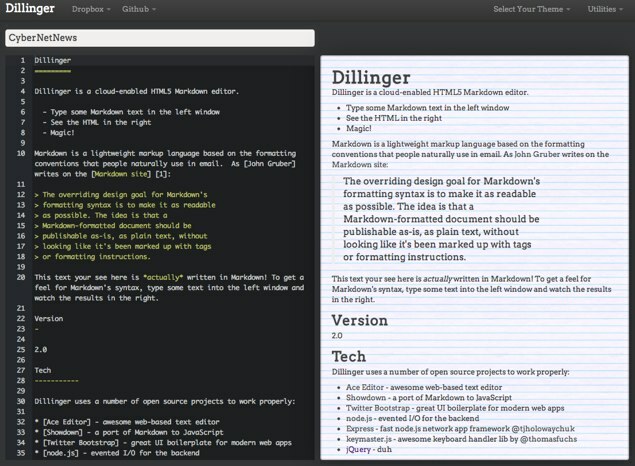 We’ve covered some other Markdown editors on the site before, but if you are looking for a web-based solution Dillinger is definitely one of my favorites. It has a slick interface that you can customize using one of the 24 themes they provide. And like most other Markdown editors you are given a window to type in along the left side of the screen while the right side shows a real-time preview of what the formatted version will look like. You don’t need an account to use Dillinger (nor do they offer accounts), but that doesn’t mean if your browser crashes you should worry about what happened to your note. Dillinger is utilizing some HTML5 technologies to make sure the content of your note is automatically saved on your machine. You can even test it out by going to the site, typing something, and refreshing the page. All your changes will still be there. When you’re done with your document you have a couple of options. You can export it as a Markdown or HTML file, but they also offer the ability to tie it to your Dropbox account. That’s the method that I’d recommend because you’ll then be able to open and save from your Dropbox, which makes the whole process a lot more seamless.